I have needed new chairs in my kitchen ever since we moved into this house 3-1/2 years ago. 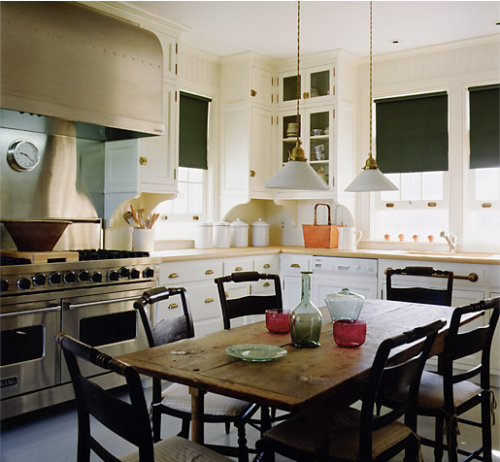 We originally had our reproduction black Hitchcock chairs with a pine table which looked great like they do here in Gil Schafer’s kitchen . But then we got a bigger cherry farm table and at the same time lost 2 of the chairs to our new overzealous lab when he was a puppy teething. So the question was what to do. First I thought wicker would be nice – a good texture and color contrast against the cherry and a slightly more contemporary feel. 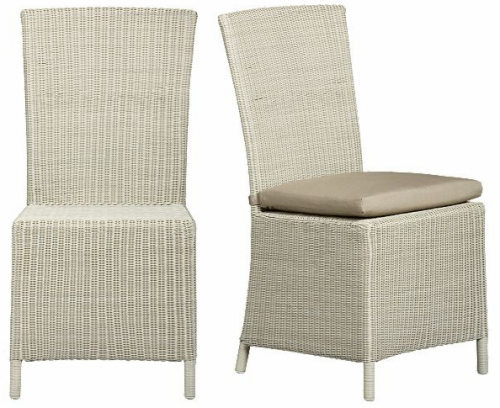 These Captiva Seaside White Side Chairs from Crate and Barrel seemed like a good choice but I got worried about the food getting stuck in the crevices with all the kids and my tall husband didn’t like that he couldn’t curl his legs underneath. Next choice was a Windsor. 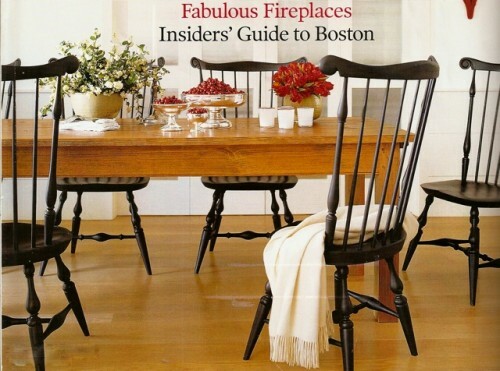 I had seen a terrific one in an old Elle Decor (see below) that I tracked down to Warren Chair Works here in Connecticut. Everyone loved this choice except that due to the wide back, I could never seat more than 6, which didn’t work when the kids had friends over or at holidays. So I gave up for a while. Fast forward a couple of years to this past June when I am at my daughter’s elementary school graduation party at a class mom’s house. Now this isn’t just any house – it’s a beautiful shingle style house on the water, decorated by Allison Caccoma. 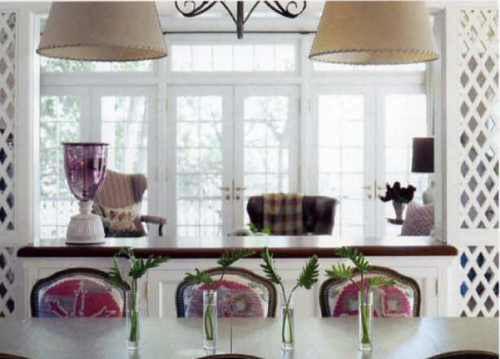 It had been featured in At Home Magazine (see the full article on Allison’s site in press) and I remembered admiring the vinylized Robert Kime fabric on the antique Louis XV chairs in the kitchen as shown below. Well seeing them in person sealed the deal. So there we were – the perfect solution. Now do my chairs have to be antique Louis XV? 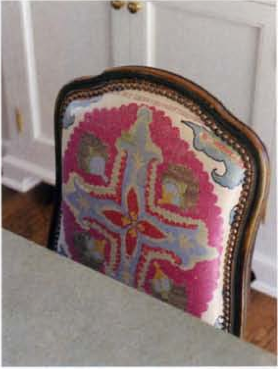 Of course not – a great Louis chair from Artistic frame, Oly or another source would do the trick. And does it have to be that Robert Kime fabric – well maybe. I think I may just know what to ask Santa for. This entry posted in architecture, interior design, kitchens. Entry Tags: Gil Schafer, Oly, Robert Kime, Warren Chair Works Bookmark the permalink. 78 queries in 0.460 seconds.